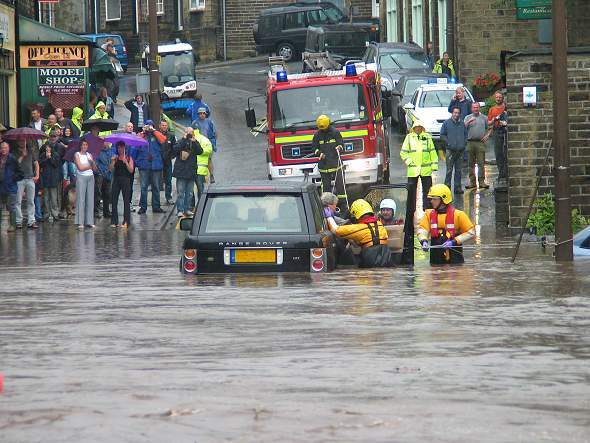 10th August 2004, Haworth Mill Hey was hit by flooding this morning after prolonged rain. Bridgehouse beck burst its banks and flooded parts of the area. The fire brigade were called out to rescue a driver who was trapped in his car. Trains are back in operation on the Keighley and Worth Valley Railway. They were closed 10th August due to the flooding at Haworth station. Some of the footpaths including part of the railway walk from ebor to vale mill lane are closed. "Torrential rain resulting in flooding of Station Road and Mill Hey caused a great drop in attendance a.m. At noon Head Teacher gave instructions to children who went home for dinners that it would probably be wiser to stay home during afternoon. Dinner children not allowed to leave school except to attend lavatory. School dismissed 3:30pm Waters having by this time somewhat abated". In 1946 the flooding affected Keighley, Glusburn and Cross hills, persistent rain the evening before amounting to 2.78 ins fell and eye witness acounts said it was the heaviest rain in 30 years. The Haworth flood was similar then as now. In 1946 it happened at about the same time at 8:00 in the morning and burst through a retaining wall at Bridge house. It appears to have happened as quickly, the speed of the rising water caught the driver of the lorry out.